Zelda now has a healthy heart, as well as a healthy appetite. The Veterinary Health Center at Kansas State University has just performed its first surgical implant of a pacemaker in a 4-year-old ferret named Zelda. Surprisingly, Zelda isn't the first ferret to undergo the procedure, but it's an extremely rare occurrence. Carl Hobi, who owns Zelda and three other ferrets, noticed last December that Zelda's appetite was off and she was lying down more than normal. He took her to an animal hospital where an EKG showed she had a low heart rate, and the vet recommended she be seen by a cardiologist at the KSU vet clinic. Testing determined that Zelda had a third-degree atrioventricular block in her heart that was slowing her heart rate. Zelda was then admitted to the health center for pacemaker implantation. The pacemaker had to be specially ordered because of the animal's small veins. KSU wouldn't reveal the price tag for Zelda's procedure, but did say it was paid out of pocket and estimates range from $2,500 to $4,000. 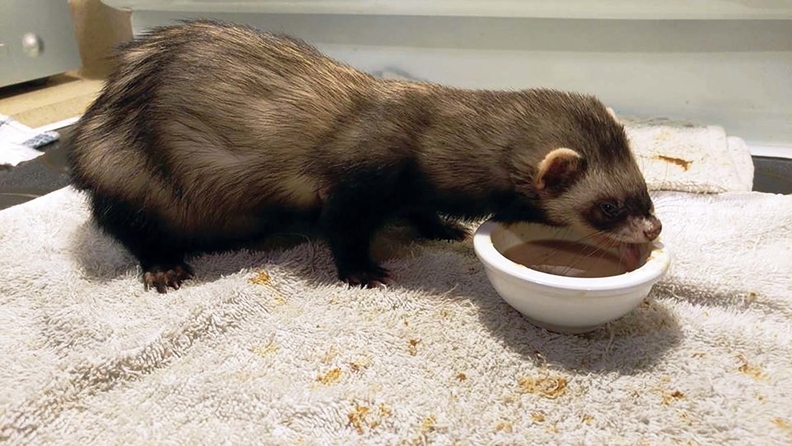 Zelda was released two days after surgery and should enjoy a normal ferret lifespan, about 10 years.